The 40th annual Print Sale is a chance to see student creativity and talent in display. UC Santa Cruz’s hard-working undergraduates deserve recognition for their vision and determination, whether they’re cobbling robots together, studying planets and ecosystems, setting up high-tech interactive exhibits or staging plays. Student Achievement Week from June 2-6 recognizes students for their research and scholarly activities. Much of the actual work takes place out of the limelight, in labs, in libraries, in studios, and out in the field, but this very special week gives students a chance to share their work in a public setting. It’s also the time of year to honor outstanding achievement by undergraduate students in each division. This year’s Deans and Chancellor’s Awards recipients are a diverse and enterprising group, focusing on subjects ranging from Santa Cruz silent cinema to dental robotics and the computational design of a melanoma treatment drug. Chancellor George Blumenthal will be on hand to acknowledge the recipients and their faculty mentors at a private luncheon. Meanwhile, the identity of the Steck Award winner – selected from the Chancellor’s Awards winners – will be revealed near the end of the ceremony. Last year’s Steck honoree is Kristoffer Hellén, who traveled to Europe and Russia to find out how two groups—the Estonians and the Maris—preserved their heritage in spite of, and in some sense, because of, living in places where cultures and religions clash and converge. There will be plenty of other opportunities for well-wishers and community members to celebrate high achievement on campus. In fact, so much is happening that you would do well to consult your handy campus map as you make your way from venue to venue. One early highlight is the Sesnon Gallery’s annual Irwin Scholarship Award exhibition from May 22 through June 14, showcasing some of UCSC’s most promising student artists working in painting, photography, printmaking, sculpture, installation, video, digital media, and social practice. Open Studios, featuring student artwork in a variety of media including drawing, painting, print media, sculpture, photography, and electronic art, will be held Friday, June 6, from noon to 4 p.m., at the Baskin Visual Arts Center and Digital Arts Research Center (DARC). Open Studios runs in conjunction with the Digital Arts & New Media (DANM) Open Studios. 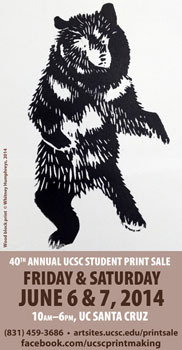 Expect large and enthusiastic crowds for another Student Achievement Week favorite: the UCSC Print Sale, which celebrates its 40th anniversary this year, and takes place Friday, June 6, and Saturday, June 7, from 10 a.m. to 6 p.m. The sale will be held at the Printmaking Studio, Room G-101, at the Baskin Visual Arts Center. Items for sale will include original etchings, lithographs, woodcuts, digital prints, handmade books, and everything from “soft sculptures” to pennants, banners, postcards, and journals. Profits benefit the student artists and the UCSC Printmaking Program. The event is also a chance to meet the artists and tour the printmaking facility. One highlight of Student Achievement Week requires a visit to downtown Santa Cruz, but is well worth the side trip. The eighth-annual Social Documentation Graduate Exhibition, an evening of documentary films from student of the Film and Digital Media's Social Documentation program, will be held Wednesday, June 11, at 6 p.m. at the Del Mar Theatre, 1124 Pacific Ave, Santa Cruz. Those who are craving a taste of Shakespeare should not miss Shakespeare To Go: "Hamlet" on Friday, June 6, at 11 a.m., at the Second Stage in the Theater Arts Center on campus. This year, a company of UCSC students will distill the tragic play into a fast-paced, inventive one-hour version in the group's final performance of the season. The event is free and open to the public. Another highly anticipated event, shining a spotlight on outstanding undergraduate research, is the 17th Annual Undergraduate Research Poster Symposium, set for Thursday, June 5, from 2 to 4 p.m., in the Jack Baskin Engineering Courtyard. The event recognizes and promotes outstanding undergraduate research while allowing students to present their findings in a professional setting.